Increasing rare-earth exports from China are just the latest problem for Molycorp. China's rare earth mineral exports have both led to the rise of Molycorp (NASDAQOTH:MCPIQ) and other rare-earth mineral miners and been a big part of their downfall over the past two years. If China restricts rare-earth exports it causes a shortage in the market and raises prices, and if the nation increases exports the fragile market becomes flooded and prices drop. That's why the exports from China are a huge concern for Molycorp and its competitors. Last year, total Chinese rare-earth exports were up 13.8%, while rare-earth metal exports increased 38.3% overall. In January, rare-earth exports rose 81.7% from a year earlier and rare-earth metal exports jumped 161.8%, a massive increase at a time when prices are already low. The problem with this timing is that Molycorp and Lynas are just beginning to hit their respective production strides in the U.S. and Australia. The added supply to the market from these two mines and China's increased exports has led to drops in prices for cerium, lanthanum, and neodymium over the past few months. These are three of Molycorp's main products. The pressure on prices puts hits the top and bottom lines, and that's where Molycorp really struggled in 2013. You can see below that revenue was fairly flat despite the company increasing product sold from 1,438 metric tons in the third quarter of 2011 to 3,620 metric tons in the third quarter of 2013. That's the result of rapidly falling prices for rare-earth minerals and related products. 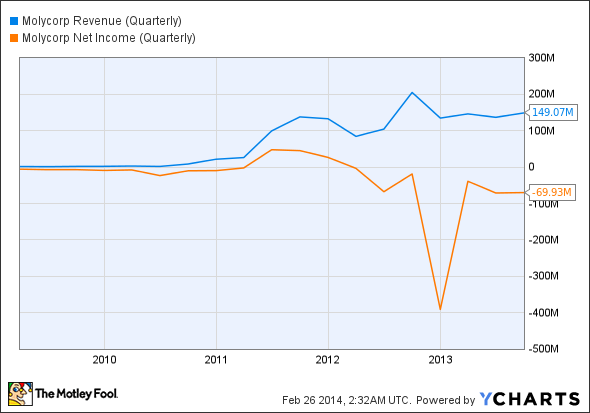 MCP Revenue (Quarterly) data by YCharts. As bad as the financials are today, there's a lot of potential for Molycorp if rare-earth prices pick up again. What will it take for that to happen? There are three keys to Molycorp's future success. China would have to stop increasing exports because it can single-handedly flood the rare-earth market. Second, and most important, demand for rare-earth minerals is going to have to catch up with production. Molycorp and Lynas are putting more than 40,000 metric tons of these minerals into the market that didn't exist a few years ago, and that product has to go somewhere. Finally, dozens of junior miners such as Avalon Rare Metals and Rare Element Resources have to remain on hold so they don't flood the market with product again. If they do produce rare-earth minerals, it could undo increased demand or easing exports from China, once again flooding the market with supply. The challenge is that Molycorp can't control any of these factors for success. It is at the market's whims, and right now prices are so low that the company can't make a profit. This was a speculative stock when it was hot in 2010 and 2011, and when the reality of its mine's production became a reality, it became a disaster. I don't see that changing anytime soon.